The new 7.10 LTS version of Nuxeo was just released. I am very happy to report it runs very well on SmartOS in a Ubuntu Linux LX Zone. Why a LX zone and not a native SmartOS zone you may ask? Well let me tell you why – most of the Document Management systems I have tested, seem to rely very heavily on OpenOffice. Trying to satisfy the dependencies of OpenOffice and get it to run reliably on vanilla SmartOS, is as much fun as trying to sandpaper the belly of an alligator in a phone booth while blindfolded! Niels Goossens, the owner of the smllr blog will likewise concur that the difficulty of trying to get Document Management solutions running natively on a SmartOS zone is not a trivial endeavour. Since I was testing this for a university client, all local SmartOS test Node platform images were updated accordingly, to emulate the exact same PI that the university is currently running in production. This is important to ensure that the same specific LX brand on the same Platform Image was tested against. Primarily to avoid any unknown quirks related to Platform Image / LX dataset version interactions when running Nuxeo in production. Preamble : The test zone was configured with 4GB of RAM – which is the minimum requirement. 2 CPU cores were allocated. In a production setup, considerably more cores / ram should be allocated and the Java Heap size and other settings should be optimised and adjusted accordingly. As a side note, even on this simple test setup after 24 hours of operation, RAM usage was only 1.3GB with an average CPU usage of approximately 2%. In production the system can be scaled to handle extremely large environments with large volumes of document data – this is addressed in detail in the technical Q&A section of this blog post. Fix the Locales for specific country you are in, and then add the official Nuxeo repository. Current Nuxeo Platforms require Java JDK version 1.8 – This is not available in Ubuntu. Although in theory, a similar OpenJDK version could be used, there is mention in the Nuxeo forums/docs to use the supported Oracle version. The recommended way to install this is directly from the Oracle website after accepting the license agreement. During the install process you will be prompted to install a database and to specify an ip address to listen on. In this test setup I used the default of PostgreSQL. Once the installation is completed, the remainder of the setup is done within a web browser. Note : Immediately after Nuxeo is first started you will notice some CPU spikes as the sample content is indexed and thumbnails etc are generated. This will be evident via running the Linux top command and you will see ffmpeg and imagemagick activity. During the due diligence phase of this project, there were some additional questions that needed answering. Before proceeding with the answers – I should reiterate how totally impressed I am with the quality of the the documentation available from Nuxeo. It is simply superb and up there with some of the best documentation I have ever seen from any company or product. They definitely consider their documentation important and regularly update it . What operating systems clients are available for Nuxeo? Is re-branding the UI difficult? What type of API is available? Can you use external user databases/oauth? Nuxeo handles scale-out by enabling a clustering mode. In clustering mode you can have multiple Nuxeo Server Nodes connected to the same database server. In order to scale and handle more requests you simply add more Nuxeo nodes/servers. When running in Cluster mode it is strongly recommended to use REDIS to share caches between nodes and make cache more efficient and avoid invalidation issues as well as share scheduled work queues. What do upgrades look like? Nuxeo always recommends upgrading to the latest public release when it is available. Each release addresses bug fixes and possibly adds new features. Each release is carefully tested to ensure it does not break anything both in terms of backwards compatibility, API compatibility and data migration. They provide guidelines for each update and its generally a simple and painless procedure. 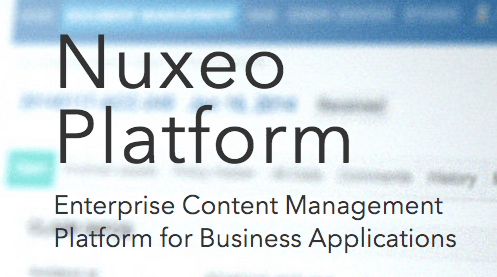 Nuxeo ECM Open Source is one of the better if not the best document management system I have tested. It is easy to use, intuitive and heavily customizable. It seems to run very well on a LX branded zone, thank you Joyent for making LX zones possible on SmartOS and opening the door to using the myriad of Linux only applications on SmartOS while retaining all the benefits that native SmartOS containers provide. Most of all thank you to John Paul Catholic University for sponsoring this work and openly sharing this information so that other SmartOS users may benefit.